Get the facts before the May 1 and May 15, 2017 votes! These FAQs are designed to get you the facts related to this proposal. Fortunately, there are literally thousands of pages of data available to answer questions, including hundreds and hundreds of pages specific to Dover, and these FAQs seek to condense that data for you. If you have additional questions or would like to learn more, the Friends of the Dover Greenway will happily help you and can be reached at dovergreenwayfriends@gmail.com. Q: What is the Dover Greenway? A: An abandoned rail bed runs through Dover essentially parallel to Centre Street from the Charles River through to the Medfield town line near the high school. Currently, it is overgrown and largely inaccessible. The Greenway is a proposed recreational trail that would run along the abandoned rail bed. Conversion of the existing rail line would involve removal of the rails and ties, and covering the rail bed with a surface of stone dust. This surface would be suitable for walking, jogging, bikes with regular tires (not racing bikes) and cross-country skiing in the winter. This trail would be a flat trail that connects many of the landmarks of our town; Chickering School, the library, the Legion, Town hall, churches, Caryl Community Center, stores and the middle and high schools. It would provide a safe and convenient resource for traveling between these locations, going for a walk or jog or just meeting friends. For even more information, watch our Dover Greenway introductory video. Q: How would Dover acquire rights to this land? A: Dover can acquire the land by signing a 99-year lease with the current land owner, the MBTA, for $99 dollars. The MBTA has entered into similar leases with dozens of other towns for the same price to encourage towns to make use of abandoned railway corridors. If approved, Article 18 will authorize the board of selectmen to negotiate and enter into the lease. Q: Won’t this be expensive for the town? A: No. The lease itself will cost only $99 for the entire period, and a private group of Dover residents have committed to fund the entire construction and maintenance funds for the conversion project. This same group was able to raise almost $50,000 from town residents just to fund the feasibility study recently completed for the town to assess the costs and benefits of the conversion. Q: What about construction and maintenance? Who will pay for the Greenway? A: The construction and maintenance will be entirely funded through private donations. The Friends of the Dover Greenway is a grassroots organization dedicated to raising awareness for the trail and will raise the funds from Dover citizens and businesses to construct and maintain the trail at no additional cost to the town. There is a large and growing base of support for the Greenway that will lead to fiscal support for the project. Q: How much will the construction and maintenance cost? A: Beals & Thomas estimates construction costs for a stone dust surface trail to be approximately $900,000. Adding best and worst-case scenarios and planning for unknown contingencies and potential cost overruns, the cost could range from $785,000 to $1.37 million. According to the town’s rail trail committee (an ad hoc committee formed by the town’s Board of Selectmen), with volunteer labor for general clean up, there would be no incremental cost to the town’s existing infrastructure to maintain the trail. According to the Beals & Thomas report, actual maintenance costs would average $4,000 per year. Q: I’ve heard that Weston estimated that maintenance costs for a rail trail (in Weston) would approach $160,000 per year. Is this true? A: This is an excellent example of how facts can eliminate confusion and misinformation. Some opponents of the Greenway have sought to discredit the town’s independently commissioned reports on maintenance costs by pointing to a 1997 study commissioned by opponents of a rail trail in Weston that estimated maintenance costs of up to $160,000. However, this report was designed to be misleading in a number of ways. First, the report is based on preliminary “gut check” estimates from town administrators asked to estimate the maximum possible amount needed to maintain the trail. This resulted, for example, in the Weston police department “estimating” anything from $0-100,000, and the report included the $100,000 estimate in its total figure. Most importantly, however, the Weston report’s estimate assumed that the town would need to create all services from scratch, meaning that the report ignores the fact that essentially all of the maintenance services could be provided by town infrastructure that already existed. Don’t be misled by this report! This should be compared and contrasted to the deliberate work done by our town and Beals & Thomas in answering the same question. These two reports paint a very different picture. 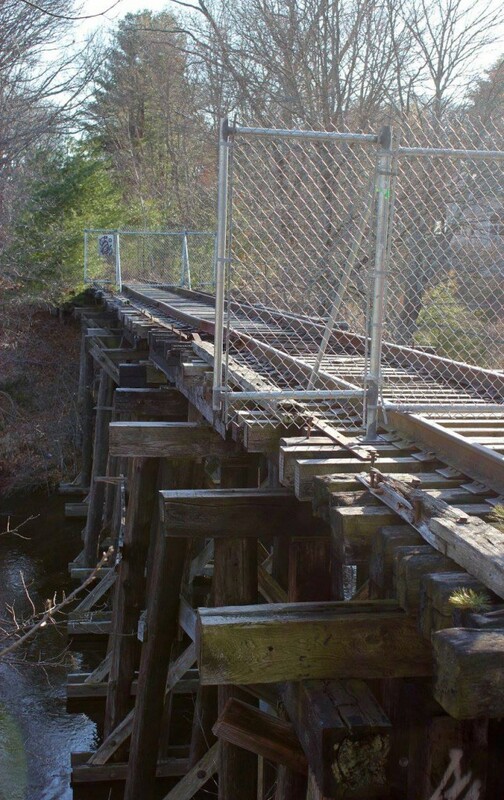 According to the town’s rail trail committee (an ad hoc committee formed by the town’s Board of Selectmen), with volunteer labor for general clean up, there would be no incremental cost to the town’s existing infrastructure to maintain the trail. According to the Beals & Thomas report, actual maintenance costs would average $4,000 per year. Q: I’ve heard there are environmental concerns and potential contaminants on the rail bed. Is this true? A: Actually, the biggest environmental concern is leaving the rail bed in its current condition. Because this land has been neglected for so many years, there are important questions about the current state of the rail bed that deserve to be addressed. For example, the creosote-soaked rail ties present the most significant environmental risk to the property, and the current owner has no plans to address this risk. By acquiring the lease, the town would be able to take simple steps to mitigate future environmental concerns. Fortunately, the best solution to address this potential neglect is actually to remove the rail ties and cap the rail bed with gravel and stone dust — in other words convert the rail bed to a rail trail. This solution is confirmed in the Beals & Thomas report and by the Friends of the Dover Greenway after consulting with a number of licensed site professionals (LSPs), including those with direct experience in mitigating environmental concerns with abandoned rail beds. Q: What about other potential contaminants such as herbicides and pesticides that may have been used by prior owners? A: The possibility of soil contamination caused by the historic use of pesticides and herbicides is a potential concern that needs to be addressed. We are actively researching this concern and are determined to collect hard statistical data on this topic, which we will share with the community as soon as we have the research assembled. We will post the results here. Q: If environmental issues are discovered, will the Town of Dover be liable? A: No. This is a common misunderstanding. Massachusetts state law actually protects towns that enter into rail trail leases with the MBTA, ensuring that the town will not be liable for pre-existing environmental issues. However, the town can further protect itself against environmental liabilities by purchasing an insurance policy that is expected to cost only $50,000, half of which would be subsidized by the state. We think this is a sensible and effective approach to mitigate the environmental risks. Q: What about water wells along the rail bed property? Is there a risk of well contamination for those near the Greenway? A: No. As part of its report, Beals & Thomas analyzed potential water well contamination and, based on discussions with the Massachusetts Department of Environmental Protection, determined that there is no present contamination and a rail trail conversion would only improve any risks of well contamination. In addition, we have spoken with the Dover Board of Health and Colonial Water about potential risks to well water and were told that there is no risk to any abutter wells. The railroad has been in place since the late 1800s and was active through 2006. There have never been reports of contaminated wells, including during the active rail period, when wells would have been at high risk for contamination. Q: I have heard about significant cost overruns in rail trails in other areas, particularly with respect to unknown environmental issues. Could this happen in Dover? A: Nobody can dismiss the possibility of unexpected issues in a construction or conversion project. Instead, what we can do be informed on risks faced in similar situations, plan for contingencies and ensure we are prepared to face unforeseen issues. The town’s Rail Trail Committee, Beals & Thomas and the Friends of the Dover Greenway have each taken this approach, referring to the pages of data on costs from similar projects in Massachusetts. Opponents have pointed to press articles announcing major cost overruns in other rail trail projects (one from Adams, Massachusetts in particular) that do not tell the complete story and are meant to inspire fear. For example, the Adams, Massachusetts article being circulated announces a potential cost overrun identified by the press in 2012 but fails to include the follow-up from the town and other press articles that note in 2014 that the project in fact finished within budget, with the reported 2012 overrun turning out to have been inaccurate, either in its reporting or its initial estimate. Q: Is there a risk to Dover if we do nothing and leave the rail bed “as is”? A: Yes! First and foremost, there is a serious risk to our children and adults who brave the busy, narrow and winding roads for running and biking. Second, it is very unlikely that this rail corridor will sit abandoned for the next 99 years and we have seen that other companies will seek to acquire the rail corridor from the MBTA if we don’t. Q: Will the Dover Greenway connect to other towns? A: No. The Dover Greenway should be planned and constructed in accordance with the desires and expectations of town residents. Based on outreach from the Friends of the Dover Greenway to other town residents, we know that many in the town feel it is important to maintain the rural nature of our town and have the Greenway available primarily as a local resource. For those reasons (and others), the Dover Greenway will NOT connect to Needham. Even if the town residents’ views on this issue change, the bridge over the Charles River would require expensive renovations — approximately $2 million — in order to use it to connect Dover to Needham. In fact, the MBTA has put up chain link fences on both the Needham and Dover side of the bridge to prevent access (see below). The Dover Greenway also will not connect to Medfield because Medfield does not have any plans to convert their rail bed to a trail. We are excited about the potential for Dover residents to have such a fantastic, accessible pathway to use throughout the year! Q: Will the Greenway change the rural nature of our town? A: The Greenway has been designed to compliment the rural feel of our community while emphasizing many of the local sites. It is the only path that has the ability to connect almost all of the important sites throughout Dover and the only path that would be ADA accessible. In addition, it is the only path that would connect Wylde Woods to 46 Springdale (which cost $9.8 million to purchase) and compliment the “Conservation Corridor” that the town has put much effort and money toward. Q: How many people will use the Greenway? A: According to the Beals & Thomas report, the nature of the Greenway would primarily be a local resource rather than attracting others from the region. Some who oppose the Dover Greenway have claimed thousands of people will use the trail, but this simply is not true. It is inaccurate to compare the Dover Greenway (a proposed stone dust trail) to paved trails like the Minuteman Bikeway or other similar trails that are used by performance bikers, open year round and connect up to 8 large towns. The Dover Greenway will not be paved, not be suitable for use by performance bikers, not be plowed in the winter and not connect to other large towns. Q: Will the Dover Greenway have a similar user mix as the Noanet Woodlands or paved bike trails? A: No, and this presents one of the biggest opportunities for the Greenway. For the most part, Noanet and other trail networks in our town consist of terrain that is inaccessible to small children on bicycles, those with strollers, older adults and those with disabilities that make accessing trails with roots, rocks and steep terrain difficult or impossible. The Greenway presents a resource not currently available in our town for these people and other town residents to enjoy our wonderful outdoor spaces. In addition, we should not expect the Greenway to be a regional attraction. Noanet Woodlands and other trail networks within our town are also marketed broadly through the Trustees of the Reservation, which has a membership of 100,000 people. It has also been spotlighted in the Boston Globe, the Boston Herald and Trip Advisor. The Dover Greenway would be promoted for use by Dover residents only. Q: Will converting the trail increase crime in Dover? A: Dover has extremely low crime rates, despite the fact that we have many miles of existing trails around the town. Dover’s Police Chief has informed the Town Rail Trail Committee that he does not predict any increase in crime from use of this trail (see Dover Rail Trail Committee report 2014). Surveys from many other communities that converted their rail lines are in agreement with this conclusion. 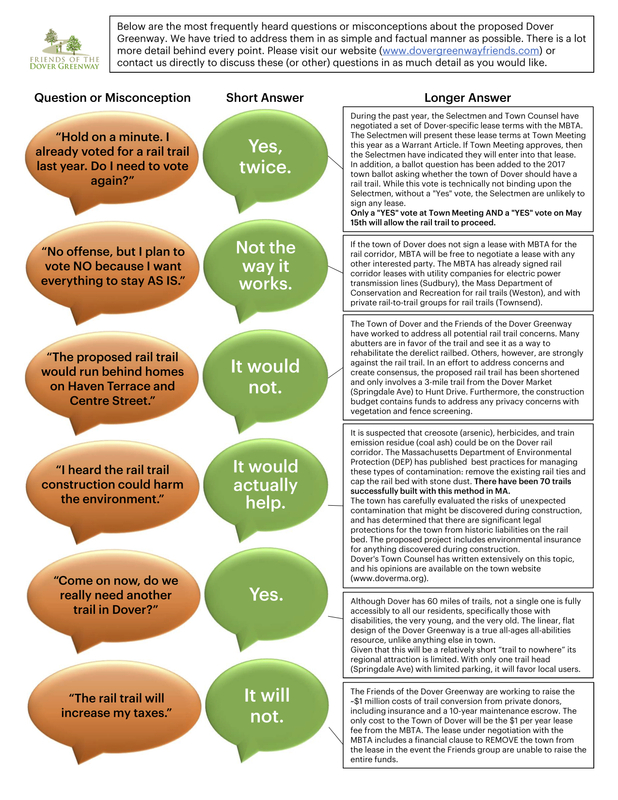 By way of example, a Minnesota study concluded that residents adjacent to existing rail-trails experienced much less crime than was anticipated by residents before the trail was converted and that the opening-up and use of the overgrown trail was actually seen as a deterrent to those with criminal intent. In another study, the city of Seattle undertook interviews with local police officers and residents adjacent to a 12-mile urban rail trail. The study found that incidents of vandalism and burglary did not increase as a result of the trail. To the contrary, the rate of vandalism and break-ins to adjacent property was well below the neighborhood average. There are many more studies confirming these same results, which we would be happy to provide anyone who has this concern. Q: Will the Greenway negatively affect my property value? Q: Won’t the trail just increase the number of performance cyclists coming through Dover? A: No. The Greenway will not be suitable for performance bicycles. The proposed stone dust surface will not be suitable for the thin tires of performance bikes and could actually puncture them. Even if the trail were suitable for such bicycles, the length of the Dover trail (3.5 miles) would be considered too short for this type of use in any case – performance cyclists typically seek rides of 20-50 miles. Finally, since the trail will not connect to Needham, it would not be a suitable means of commuting. Comparable trails (with similar surfaces) report about 40% bicycle use (including kids), 40% walkers, and 20% other (strollers, joggers, skates, cross-country skis). Q: Who will cover public safety on the trail? What if there is an accident? Will the town have to buy more equipment to cover the trail? A: Public safety incidents on the proposed trail would be covered in the same manner an accident on any of the 60+ miles of other trails around town are currently covered. Since the trail would be flat and easily accessible from multiple points around town, it would provide no more of a challenge than any flat public land. Dover public safety officials have reported to the town’s Rail Trail Committee that they do not require any additional equipment to patrol or access this additional trail (Dover Rail Trail Committee Report 2014). Q: How will this affect our neighbors whose property backs onto the trail (abutters)? A: Abutters have legitimate concerns about safety, privacy, and property values when rail trails are proposed. Thankfully, these pre-trail concerns rarely become issues when trails are converted. In post-trail conversion surveys of abutters, the majority (70%) report the trail actually was beneficial, rather than detrimental, or had no effect, to them as residents. In Dover, about 60 properties directly abut the trail. The Friends of the Dover Greenway has actively worked with abutters of the rail bed to address concerns and is committed to work with the owners of these properties and the town to ensure appropriate and reasonable efforts is made to maintain privacy. Q: Why was there a vote against this project at Town Meeting in 2013? A: At the 2013 town meeting, 172 to 160 voters voted against providing $50,000 to the town’s Rail Trail Committee to fund an engineering and environmental report with legal analysis for the project. Many reasons were openly expressed at town meeting to vote against this proposal which turned out to be untrue. The facts and data commissioned by Dover and dozens of other municipalities and regions confirm that the expressed concerns about cost, environmental issues, property values and potential crime are unfounded. These FAQs are designed to answer this questions based on the facts.